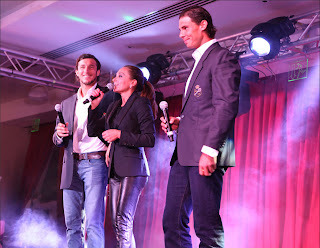 The annual ATP Player Revue took place on Wednesday night at the Monte-Carlo Bay Hotel, with Rafael Nadal and Juan Monaco hosting proceedings alongside Cristina Cimino. A number of ATP World Tour stars shed their inhibitions to entertain their colleagues through a variety of sketches, with the event orchestrated by ATP Player Relations Manager Cecilia Ghe, Anna Galoppo and former player David Ekerot. 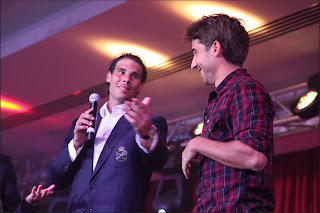 Taking part were Max Mirnyi and his daughter Melanie, who opened the evening with a show-stopping performance of “Barbie Girl”, Horia Tecau,Aisam-Ul-Haq Qureshi, Jean-Julien Rojer, Robin Haase, Rohan Bopanna,Sergiy Stakhovsky, Jarkko Nieminen, Frederik Nielsen and coach Jack Reader, with cameo appearances from Andy Murray and Marc Lopez. Stand-out performances came from Bruno Soares and Milos Raonic. Soares joined with Haase to impersonate WTA star Victoria Azarenka and her musician boyfriend, Red Foo. No-one laughed louder than the Belarusian star, who was in attendance, and afterward congratulated Soares on his performance backstage. Raonic impersonated Mahesh Bhupathi in his first performance, and later took to the stage with Nielsen in a fun send-up of his doubles partner this week,Bernard Tomic. After sportingly laughing through the sketch that called into question his own on-court quirks, the Canadian was then front and centre in the Harlem Shake performance that closed the show. 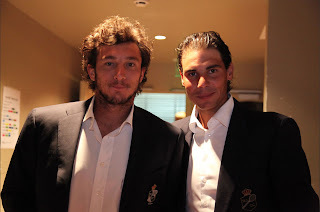 The evening ended with some swift make-up and high-heels removal, and 2012 Wimbledon doubles champion Nielsen making sure his eye-liner wasn’t too prominent as he made his way out.